During the past few months we have kept you updated with the progress of our enterprise cross media search solution with the MICO platform. Now we are pleased to announce the release of the Sensefy search public demo, available at mico.zaizicloud.net. Sensefy extends the traditional keyword based search by providing the ability to search documents using concepts and entities. Please note that you can still use keywords for document retrieval with Sensefy. Sensefy user interface provides you with smart suggestions under following categories. An example for search suggestions is given below. Entity and Concept driven search is based on suggestions. 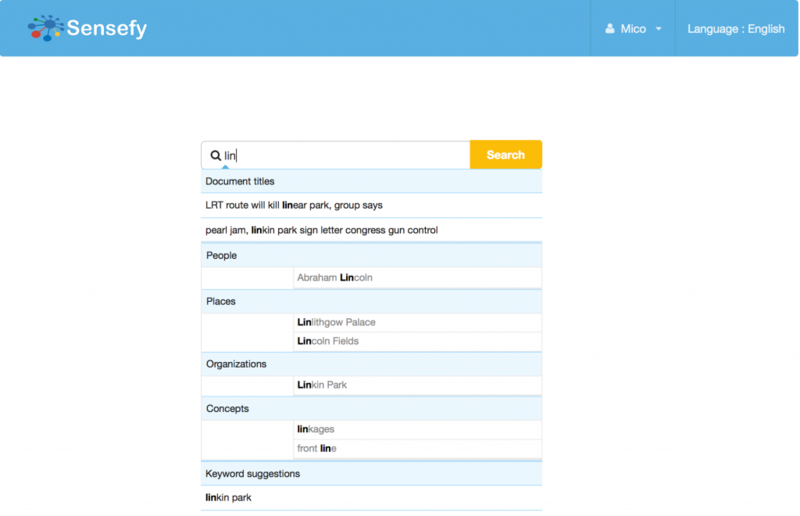 You can select an entity or a concept from the list of suggestions to trigger entity driven search. Otherwise system will carry out the keyword based search for you. Entity driven search is capable of providing you search results with high accuracy compared to keyword based search. For example consider the search results for keyword “linkin park” vs entity “Linkin Park”. This example is shown in the figures below. 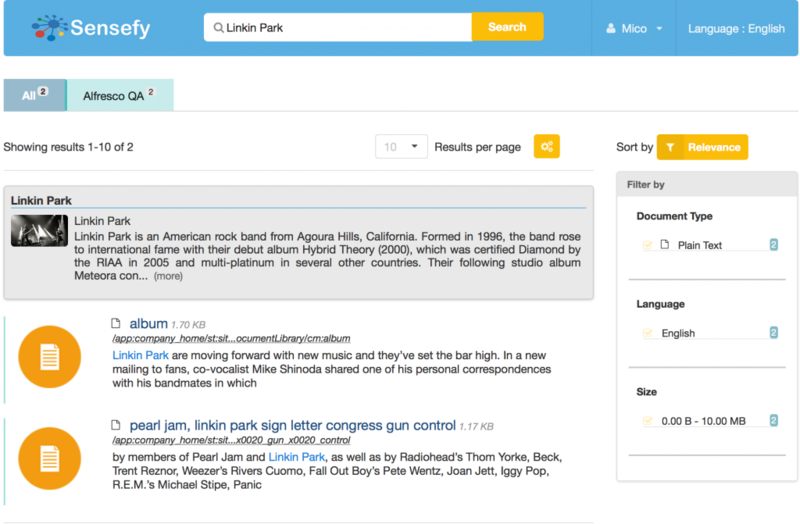 Entity driven search results contains only the documents related to music group “Linkin Park” while keyword based search results include some inaccurate documents. Sensefy with MICO integration allows you to retrieve documents in different media types including unstructured text, videos and audios with concept driven search. 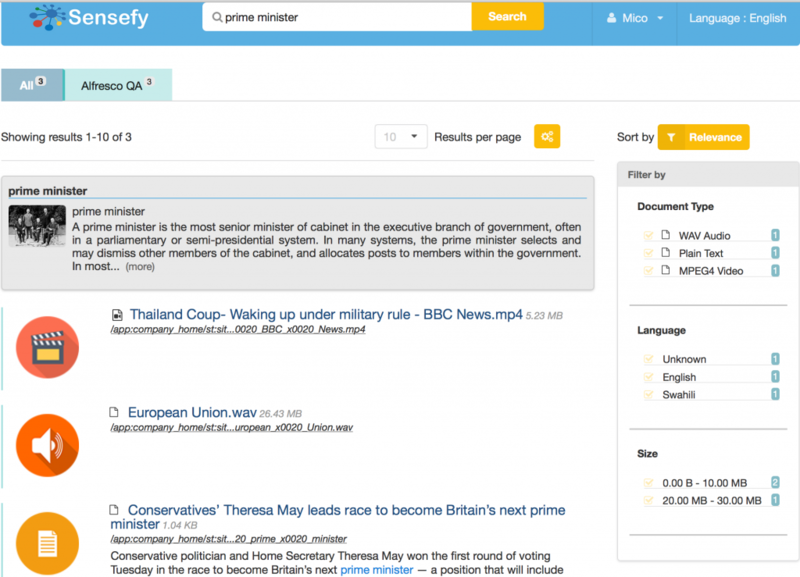 Sensefy faceted search allows you to quickly narrow down your search results to more specific ones with the use of filters on data sources, document types, languages, document sizes and set of automatically identified topics. User permission management is one of the most important aspects of enterprise search. Behind the scenes Sensefy manages user permissions by enforcing security policies of content repositories with ease. Sensefy is open source and released under LGPL. Source code is available at our GitHub page. For Sensefy-MICO integration you need to checkout the sensefy-mico branch. Please follow the instruction given in readme file to build and run Sensefy. For a detailed guide on building and configuring Sensefy, follow the document on How_To_Run_Sensefy. Please contact us for more details and any issues on our GitHub page. Sensefy entity and concept driven search is currently limited to searching one entity or concept at a time. 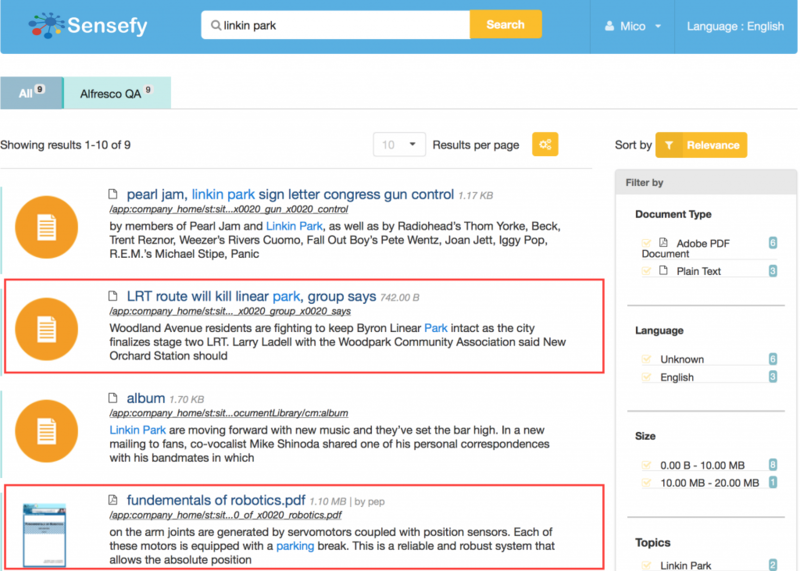 In the next version of Sensefy we will provide you an interface in which you can combine multiple entities and concepts to build more complex search queries. Please keep in touch with us for updates on Sensefy and MICO.